House shopping 101: Custom in-fill mansions: Five risk factors. Do you know what you don’t know? Ask me! Placing offers to purchase and applying for financing and arranging a home inspection are time consuming and costly. Its good to know as much as possible about the house before taking those steps. Warranty: For financial reasons, these homes are often built without Tarion warranty coverage, and the builder is not registered with Tarion. Discuss this risk with your lawyer. Municipal and jurisdictional authority’s’ compliance: Permit approval is a multi-staged process. The fact that the house is for sale, or even proof of occupancy approval does mean that everything is complete and approved by the authority having jurisdiction. Due diligence is required to check completion and compliance of the building, plumbing, electrical and gas systems. 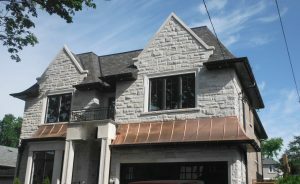 Exterior claddings, especially EIFS: Details such as weep holes for brick veneer and drainage for EIFS are notoriously bad on these houses. I have yet to find one of these houses that does not have significant issues related to the exterior claddings. Strange roofing slopes: High interior ceilings combined with height restrictions result in strange and unusual roof layouts. Typically, the top of the roof is flat, but the problem is that the slopes leading to the flat part of the roof are often too flat for normal shingle application. These roofs are not accessible with a 32ft. ladder. Very long ladders or lift trucks are required if any maintenance or repairs are required. If you are a home buyer in the GTA, feel free to contact me early in your house shopping process with the address and age of a house you are interested in. I can send you a few key questions to ask that may save you time and money.